The crystal clear 7” LCD Monitor is a perfect addition to any Horse Trailer owner/driver that needs assistance backing up. See the whole world behind you in rich colors. It is also an LCD monitor so it is very light as well as thin. 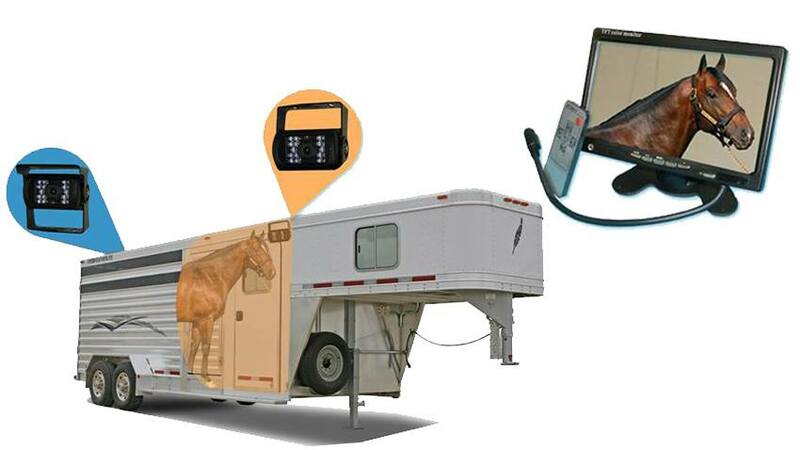 In addition, it has two video inputs so you can connect a 2nd camera to have a view inside the horse trailer. This monitor is compatible with all our cameras and any car; it connects to any power source or a cigarette lighter. It can mount on your windshield or dashboard (mount included). Super easy installation. The RV Box camera Has a 120° Degree viewable angle, it's waterproof and has auto night vision (perfect to see the horses inside your trailer in pitch dark). The camera is one of the most durable we have, with incredible adjustability and night vision clarity. The RV Box camera has a metal sun shield visor to protect you from glare and pebbles. This is by far our toughest built camera. It has been regularly used in cars, vans, buses and even industrial sized caterpillar trucks, operated in the harsh oil sand of Canada. This camera can take a direct hit from a rock and it will still work like new. It has also been very popular with RVs because its housing allows you to install the cameras on multiple sides of your RV. You can also mount this camera INSIDE your horse trailer and see your horse while driving down the road! We also have a C Clamp to clamp down the camera instead of bolting it, you can also use our battery packs and then it is truly wireless and movable. You can see how your horse is doing! This item includes a 15 Foot cable, if it's going on an RV, BUS or any other vehicle longer than average SUV we recommend upgrading to our premium extension cables located on the top left of the page.